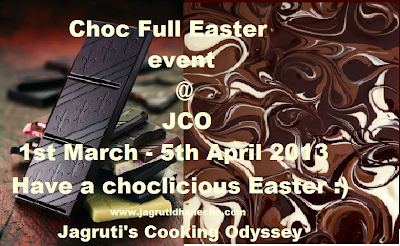 Jagruti's Cooking Odyssey: Event Announcement - Choc Full Easter ! Everyone, old and young, knows that Easter is a time for indulge in Chocolate! Easter is the time of the year when this decadent treat is devoured in abundance by most of us...For Easter, chocolates are used in making cream eggs, mini eggs, lindt bunnies and Easter eggs. 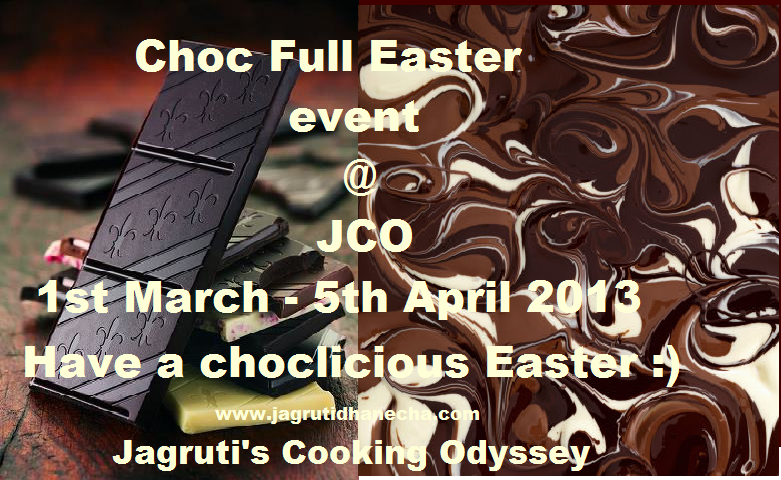 So why don't you experience chocolate even more delicious than usual by preparing the MOST EXQUISITE DELICACY in your home this Easter and link your entries on our event, Choc full Easter ! Use any chocolate, cocoa powder in cooking, baking or moulding. Dishes can be sweet or savoury. Only entries allowed are posted between 1st March-5th April 2013. Go ahead and send your chocolate recipes. Lovely event, looking forward to all the chocolate posts in bloggy world now. I'm sure you will get lots of entries for this event, who doesn't like chocolates! This event is going to be a hit for sure, wonderful event dear.